The iGrow® patented, hands-free, convenient and private in-home hair growth system provides full scalp coverage, is fully portable, easy to use and requires no manual movement. iGrow® incorporates proprietary dual light Laser and LED design. 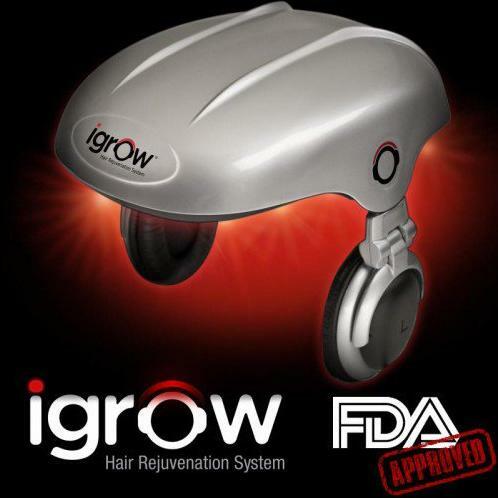 Equipped with headphones and an iPod/MP3 interface, the iGrow is a convenient and highly effective Low-Level Laser Light Therapy (LLLT) system that enables significant hair growth. Low-Level Light Therapy (LLLT) is a highly effective hair growth treatment process. LLLT increases cellular activity and promotes the proliferation of thick, full and healthy hair. The absorption of light delivered via an acute and measured wavelength (655 nm) promotes hair growth. iGrow’s patented 51 light diodes deliver a unique and highly effective combination of Low-Level Laser and LED Light for optimum hair growth. 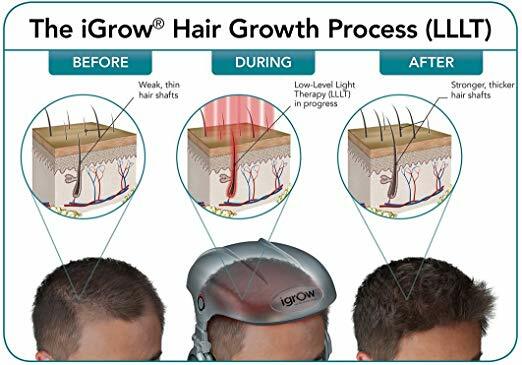 GROWS HAIR: iGrow’s® proprietary Low-Level Light Therapy (LLLT) technology utilizes a highly effective combination of red laser and LED light diodes to effectively stimulate and energize cellular activity causing an uptake in the natural function of the hair follicle. 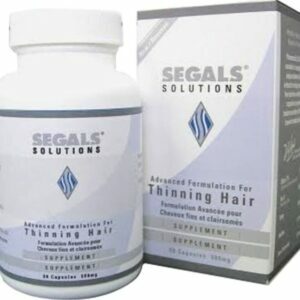 This proven 4 to 6 month process reverses hair thinning and loss. SAFE and EFFECTIVE: The iGrow® is a safe and effective in-home device, designed and produced specifically for the purpose of growing hair in people afflicted with Androgenetic Alopecia (thinning hair). iGrow’s non-invasive, proprietary Low-Level Light Therapy (LLLT) technology has no side-effects, unlike pharmaceuticals, topicals and pills used to treat hair-loss. FULLY ADJUSTABLE: The iGrow® features 4 adjustable fit columns with rotating weight distribution for optimum comfort during treatment. Headphones extend and retract to custom fit any head size. AFFORDABLE: iGrow® is not only highly effective, it’s affordable as well. A one-time purchase will provide you with everything you need to grow and maintain strong, healthy hair for a lifetime. I POD/MP3 INTERFACE WITH HEADPHONES: The iGrow® features a patented headphone-based stabilizing platform, with a standard 2.5 mm audio port which allows a quality connection to any music/audio, TV or entertainment source device, including PlayStation and Xbox. Listen to your favorite playlist, internet radio, or enjoy an audiobook while receiving treatment. OPTIMUM SCALP COVERAGE: The iGrow® is designed and crafted to effectively cover the scalp, and engineered to focus on areas prone to hair loss. The inner helmet canopy is designed to conform to contour and curvature of the scalp, ensuring consistent and equal distribution of both laser and LED lights for optimum results. SCIENCE & TECHNOLOGY: The revolutionary iGrow® features an optimum blend of proven science and technological achievement, borne from decades of research and development. A worldwide team of scientists, doctors and medical engineers have incorporated the identical low-level laser technology used by professional hair loss medical experts and by hair restoration physicians, into the iGrow to effectively grow hair. PROGRAMMED FOR EVERYONE: The iGrow® is engineered to address, treat and ultimately reverse the effects of Androgenetic Alopecia (thinning hair leading to hair loss). A remote Touch-Screen Control allows for a variety of custom treatment settings. COMPARISON WITH OTHER PRODUCTS: When compared to other low-level laser therapy devices, the iGrow® truly is unparalleled in its inherent features and benefits. Laser combs and brushes do not provide clinical strength laser and LED combination light therapy, are not hands-free and convenient/easy-to-use, nor provide full scalp coverage. IN-HOME CONVENIENCE: Consistent use of the iGrow® is supported through at home, personal scheduling convenience, with no outside third-party contact or visits. 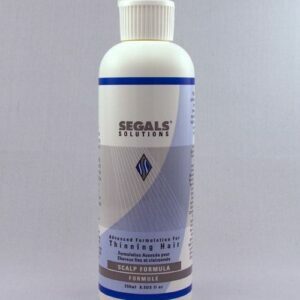 Comforting in-home privacy addresses the sensitivities of treating hair loss. Product Includes iGrow, Remote Control, Universal AC Adapters, Auxiliary Cable (For use w/MP3 player or other media), User Manual, Remote Control Cable. 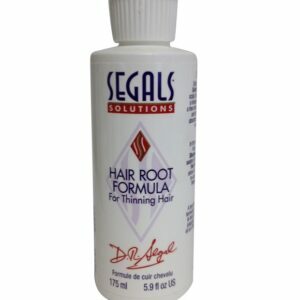 Excellent Proven Non-Surgical way to grow hair.